Whether you prefer the shade of large redwoods or waking up to a cool ocean breeze, the great outdoors have the ability to bring people back to the core of what it means to be a part of this incredible place we call Earth. When it comes to food, chefs and foodies alike are breaking out some innovative ways to manipulate the innumerable bounties to be discovered in the wild. While roughing it in the great outdoors may not be for everyone, most of us can appreciate the rugged tastes it inspires. Chefs across the nation are becoming increasingly inspired by the bounty of farm fresh ingredients available at their local farmers markets, such as locally raised rabbit, bison, and ostrich. Outdoor inspired, farm to table dishes are something even the tamest palates can enjoy. Canada is known for its wild game, which takes center stage at many of Edmonton’s local restaurants. Normand’s is known for featuring nightly specials featuring local catches and wild game nights with selections such as Wild Boar Ribs, Bison Carpaccio, Musk-Ox and Crocodile. Dining at Normand’s is every adventurous foodie’s dream come true. In a medium bowl, whisk together the mirin, 1 teaspoon salt and 1 teaspoon pepper. Add the steaks, turning to coat evenly, then refrigerate for at least 20 minutes and up to an hour. When ready to cook, in a large skillet over medium-high, heat the oil until very hot but not smoking. Add the steaks and sear on each side for 1½ minutes. Transfer the steaks to a platter and let rest for 5 minutes. Once the steaks have rested, thinly slice them across the grain. Fan the slices onto 2 serving plates, then seasoned with salt and pepper. Squeeze 1 or 2 lemon wedges over each. Serve immediately. Chef Ryan Nitschke and his team at The Hotel Donaldson pride themselves on honoring local producers and artisan farmers. Specializing in the use of bison meat as well as other locally sourced fish and meats, daily specials are often exotic, featuring everything from Goose Fat Poached Shrimp to Catfish Taco’s. What looks especially delicious? The Wild Acres Farm Duck with a peach bbq glaze. Yum! 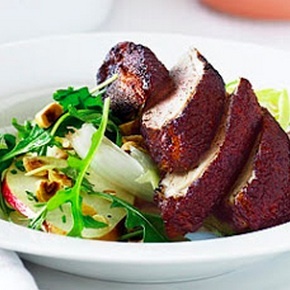 Here’s a delicious recipe for Crispy Duck Breast with Pear and Green Peppercorn Sauce to try at home! Trim excess fat from duck breasts. Heat a 12-inch heavy skillet over high heat until very hot. Pat breasts dry and season with salt. Put breasts, skin sides down, in skillet and reduce heat to moderate. Cook breasts 20 minutes, or until skin is crisp and mahogany-colored, removing fat from skillet as it is rendered with a metal bulb baster (or very carefully pouring it off). Turn breasts and cook about 2 minutes for medium-rare or to desired doneness. Transfer breasts to a plate and keep warm, covered loosely. While duck breasts are cooking, peel pear and cut into 1/4-inch dice. Pour off all but about 1 tablespoon fat from skillet and sauté pear until lightly browned, about 1 minute. In a measuring cup stir together apple juice and cornstarch. To pear add Calvados or Armagnac. Stir in cornstarch mixture, peppercorns, demiglace or bouillon cube, and thyme and simmer, stirring, 2 minutes, or until slightly thickened. Serve duck breasts, sliced, with sauce spooned over them and garnish with thyme sprigs. San Marco Ristorante has long been known as Buffalo, New York’s top Italian restaurant, featuring regional dishes from Northern Italy. Owners/Chefs Frank and Nancy Grimaldi have delighted guests with their modern translation of Italian Cuisine, featuring wild game such as Cinghiale Alle Brace (fresh tenderloin of wild boar marinated in extra virgin olive oil, aged balsamic vinegar and juniper berries) and Quaglie Del Contadino (fresh quails pan sautéed in cognac and shallots finished on the grill with a porcini mushroom sauce, roasted peppers and risotto). 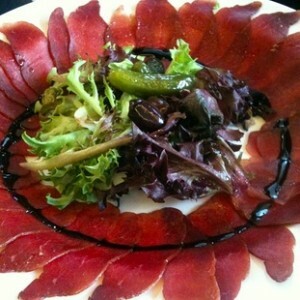 San Marco has maintained a reputation for serving up some of the best food, and wild game dishes, in town. 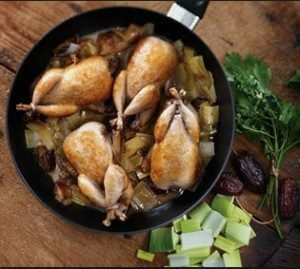 Try this rustic recipe for Braised Quails with Wild Mushrooms at home! Until next time.. Crawl on.